Website design for HVAC companies Williamsburg VA | This WordPress HVAC website generates online customer leads and supports their existing customers. VISIONEFX designs mobile friendly websites in Word Press. A Word Press website allows owners to login and edit their website using a web browser such as Chrome, Internet Explorer, Fire Fox or Safari. When searching ‘Website design for HVAC companies Williamsburg VA look no further than the premier web design experts at VISIONEFX. There is also a powerful Blogging tool in Word Press that makes for fast posting of articles and information in your site. There are a also host of different plugins that can add additional functionality to a Word Press website. 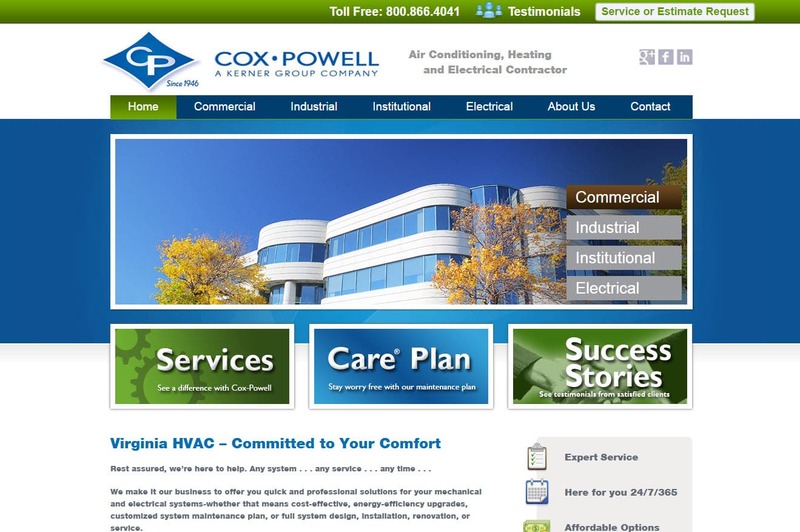 COX-POWELL is located in Williamsburg VA.
We are a professional web design company. We understand that great design elevates web sites above the rest and work to provide you the very best in web design. VISIONEFX provides services to national companies as well as small to medium businesses throughout the United States.